After a day getting some sunshine at the beach this weekend, I wanted something easy and refreshing to eat for an early dinner. I also wanted an excuse to use some amazing fresh goat cheese from my last visit to the farmer's market! These veggie wraps make a great lunch or light dinner and are easy to adjust using the vegetables and herbs of your liking. 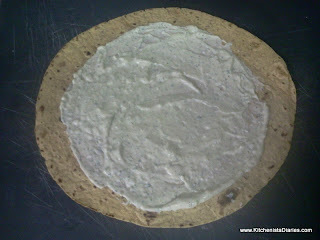 As an alternative to flour tortillas, look for a whole wheat or low-carb variety to keep this even healthier. 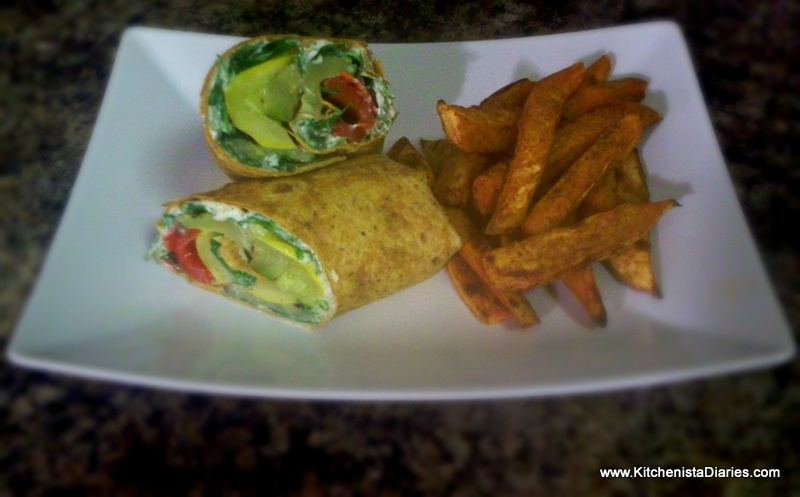 I served my veggie wrap with roasted sweet potato fries seasoned with turmeric and paprika, another easy side dish to make and a better choice than chips! To prepare the herbed goat cheese yogurt spread, combine all ingredients in food processor and blend until smooth. Season w/ salt & pepper to taste. 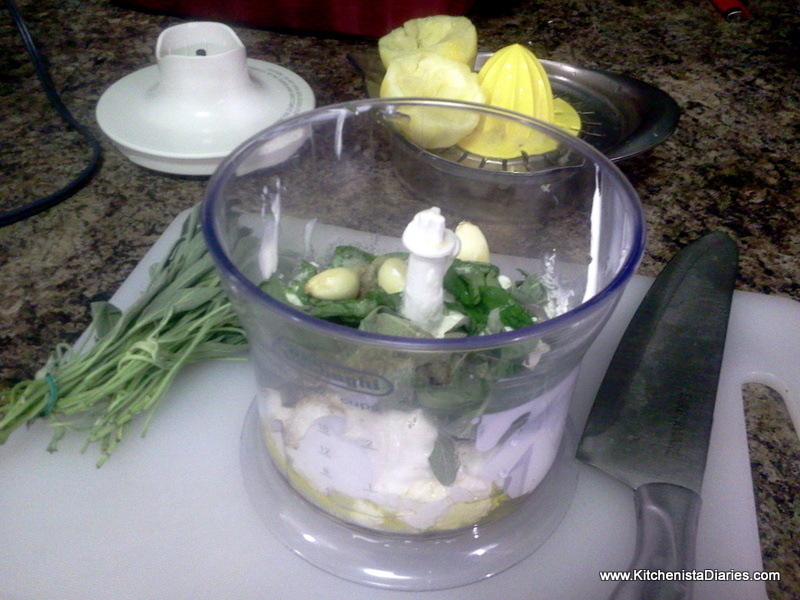 My suggestions for fresh herbs to use are parsley, basil, cilantro or even mint. In an air-tight container, leftovers can be stored in the refrigerator for up to a week (but if you're like me this will be gone in a day!) I doubled the recipe and added fresh sage to use the same spread as a substitution for ricotta cheese in a lasagna recipe. 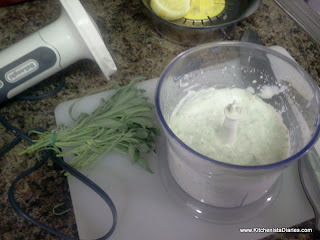 It would also make a great dip for raw veggies or even stirred into cooked pasta. Preheat oven to 400°. 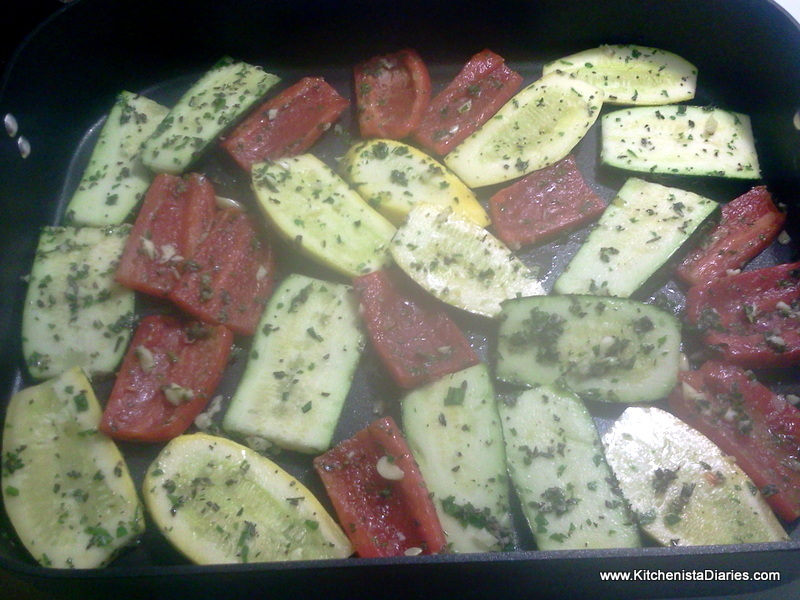 Cut veggies into thick, uniform slices and toss with minced garlic, herbs, and drizzled olive oil. I used a mix of rosemary, thyme, basil and parsley here. Season with a pinch of salt & pepper. Roast at 400° approximately 20 minutes or until just tender. You could also grill these instead. Allow to cool to room temperature. I make a batch or two of these on the weekends and store them in the fridge to use for the rest of the week. 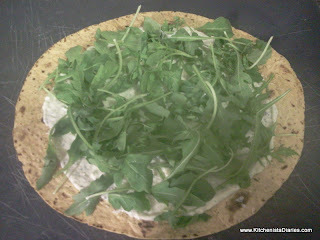 To assemble the veggie wrap, spread a tablespoon or two of goat cheese yogurt spread onto a warmed tortilla, leaving about 1" of space around the edge. Top with a generous portion of fresh greens, and season lightly with salt & pepper. 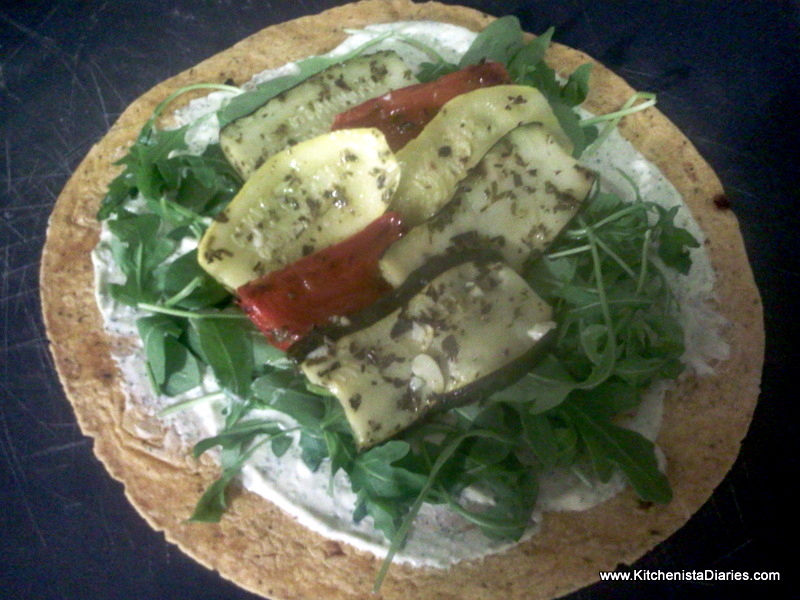 Arrange some cooked veggies over the center of the greens, slightly overlapping. 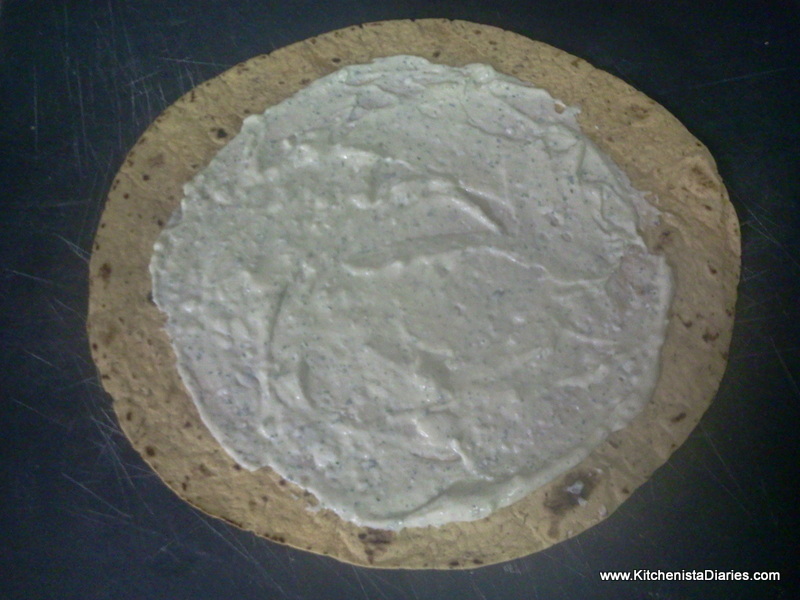 Fold the sides of the tortilla towards the center, and roll up from the bottom (like a burrito.) To serve, place the veggie wrap seam side down and cut on a bias. Preheat oven to 400°. Peel and cut sweet potato into large strips or slices, approximately 1/3" inch thick. Toss in olive oil & spices. 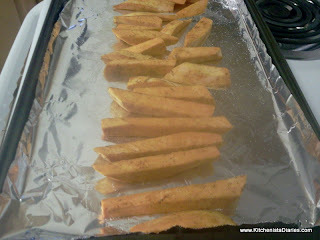 Place on a cookie sheet lined with aluminum foil and roast for 20 minutes or until crisp. Season with salt & pepper to taste.